Prime Minister Manmohan Singh will take a final decision about the increase in petrol and diesel prices by this weekend, once the elections in Maharashtra are over. It has become eminent as the international crude oil prices have now crossed over $ 53 per barrel, and the oil marketing companies are pressing the Petroleum Ministry to allow them to revise the oil prices on October 15. The sudden resurgence in terrorist attacks in north-eastern India is attributed to the emergence of Myanmar-Naga hills controlled by the NSCN(K) as an operating base for the United Liberation Front of Asom. 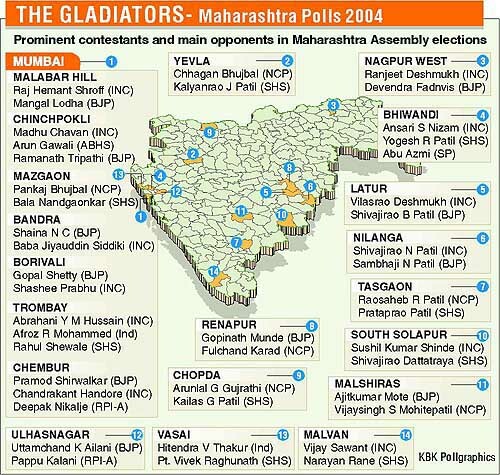 The western Indian state of Maharashtra will go to the polls tomorrow to elect the 288-member state Assembly along with byelections to the three Lok Sabha and 39 Assembly seats spread across the country. The counting of votes will take place on Saturday. Free from the Maharashtra Assembly poll campaigning, the Congress leadership is now expected to focus on the overhaul of its organisational set-up in Haryana, which is headed for elections early next year. Serious differences have cropped up between the Sangh and the BJP over the approach to the newly floated Rashtriya Swabhiman Manch with the former whole-heartedly backing it and the latter distancing from it. 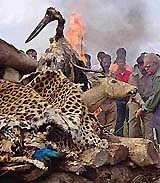 Forest officials burn seized skins and skulls of wild animals in Chilapata forest in Jalpaiguri, 135 km from Siliguri, on Tuesday. Alarmed by the recovery of mortars and shells from scrap, the Centre today issued an advisory to state governments to take all possible measures to prevent such materials from being dumped by factory owners in public places. President A.P.J. 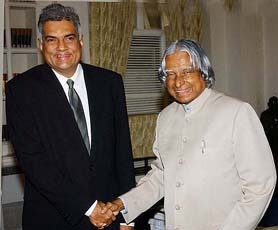 Abdul Kalam shakes hand with Sri Lankan Opposition Leader and former Prime Minister Ranil Wickeramsinghe in New Delhi on Tuesday. Congress MP Rahul Gandhi, who is on a three-day visit to his Lok Sabha constituency Amethi, listens to the grievances of people on Monday. Delhi is yet to recover from the aftershock of the Supreme Court ordering the closure of industries operating illegally in residential areas, but come October 15, many more industries risk closure for discharging hazardous waste in the Yamuna and for not contributing their share in installing common effluent treatment plants. A “dastar” of Guru Gobind Singh and shoes and “kharavan” of Mata Sahib Kaur and Mata Sunder Kaur were displayed for public viewing at the Guru Granth Sahib Research Centre, on the premises of Gurdwara Rakab Ganj, here today. The dastar is made of tussar and is beige in colour. Union Health and Family Welfare Minister Anbumani Ramadoss today said a survey was being conducted by an external agency to find out the exact number of HIV and AIDS patients in the country. Minister of State for Home Prakash Jaiswal is reaching Guwahati tomorrow to work out the modalities of the proposed talks with banned militant outfit NDFB. Joining agitating manufacturers, former Prime Minister V. P. Singh and CPM leaders today gave a 10-day ultimatum to the Centre to stop the closure of industries in non-conforming areas in the Capital, failing which they would hit the streets. The Union Ministry of Human Resource Development has instituted a probe into the functioning of the Indian Institute of Advance Study, Shimla, for alleged academic, financial and administrative irregularities. A special court today rejected the bail application of Central Excise Commissioner P.K. Ajwani, who was arrested on corruption charges on September 25. Congress Legislature Party to decide next Arunachal CM today. Model-turned-actor Dino Morea and actress Mahima Chaudhary will be seen in debutant director Neeraj Pathak's romantic thriller "Gumnam." Prime Minister Manmohan Singh will take a final decision about the increase in petrol and diesel prices by this weekend, once the elections in Maharashtra are over. It has become eminent as the international crude oil prices have now crossed over $ 53 per barrel, and the oil marketing companies are pressing the Petroleum Ministry to allow them to revise the oil prices on October 15. Talking to reporters here today, Petroleum Minister Mani Shankar Aiyar said, “Every 15 days, we have to review fuel prices and they will be reviewed with respect to the international prices on October 15. Whether the prices will be hiked or not will be decided after I place all facts before the Prime Minister”. He will meet the Prime Minister on Thursday or Friday to brief him about the impact of rising crude oil prices on the Indian economy and the burden on the state-run oil firms due to unchanged prices. Sources in the oil marketing companies claim that despite sharp rise in international crude oil prices, the average cost of Indian basket of oil products was around $ 43 per barrel, but they had suffered losses worth over Rs 3,000 crore due to this rise. Earlier, on October 1 the government had asked the oil market companies to defer the hike in oil prices for 15 days, and had directed the oil companies — ONGC, OIL and Gail — to compensate IOC, HPCL and BPCL. “Interests of consumers will be the foremost consideration. We want Indian oil companies to make their contribution for the protection of the economy and share the burden on consumers,” he said indicating that a close to Rs 3 per litre hike in diesel prices and Rs 0.50 per litre in petrol prices, needed to put domestic prices in step with the international trend, may not be carried through. Any hike in petrol and diesel prices at this juncture will fuel inflation, which is already hovering at more than 7 per cent. “We will protect the economy and ensure that the interests of public sector companies are also guarded,” Mr Aiyar said adding that the losses suffered by marketing companies on selling fuel would be offset by gains made by oil producers like ONGC by way of getting higher price for their produce. “The burden would be shared equitably,” he said. The sudden resurgence in terrorist attacks in north-eastern India is attributed to the emergence of Myanmar-Naga hills controlled by the NSCN(K) as an operating base for the United Liberation Front of Asom (ULFA). The Myanmar-Naga hills are now home to close to 4,400 ULFA cadres. The recent attacks are being staged by ULFA cadres operating from bases in Myanmar-Naga hills and are being coordinated by the outfit’s leadership based in Bangladesh, according to the Government of India’s latest appraisal on the North-East. The “secret” report, to which The Tribune was given access today, says interrogations of arrested and surrendered ULFA cadres have highlighted that the central command headquarters of ULFA is now based in Bangladesh. The headquarters is in regular communication with bases in Myanmar-Naga hills and is directing the planning and execution of attacks in Assam. Following the destruction of ULFA bases by the Royal Bhutan Army (RBA) in December 2003, Bhutan had provided ULFA ready access into the crucial areas of Lower Assam and Guwahati. The destruction of the bases has reduced the effectiveness of ULFA in these areas. Hence, a series of attacks in Upper Assam, which are closer to Myanmar-Naga hills. The report warns that ULFA has been trying to organise its remaining cadres to hit at Lower Assam and it is only a matter of time before Lower Assam sees the kind of attacks on public places and infrastructure that Upper Assam is witnessing. The recent blast in a cinema hall in Dhubri is a precursor to such attacks. Following the Bhutan operations, ULFA has focused on reorganisation of its cadres. A major exercise being conducted by the group towards this objective is organising the remaining strike forces into five battalions, each assigned with a specific responsibility. ULFA’s 109 Battalion is the formation that is charged with the responsibility of conducting operations in south bank districts of Lower Assam. This battalion is based in locations along the Indo-Bangladesh border, particularly Rangpur and Mymensingh districts in Bangladesh. The group has built small camps and transit facilities in these areas to facilitate operation of the battalion. Thus, in addition to Myanmar-Naga hills bases, ULFA is using Bangladeshi territory for basing its strike forces. Though the role of ULFA formations in Bangladesh is on a lower key as compared to Myanmar at present, the importance of Bangladesh as another major operating base is expected to grow in the coming months. Apart from the central command headquarters, almost the entire ULFA top leadership is now based in Bangladesh. Interrogations have revealed that the senior ULFA leaders were withdrawn to Bangladesh well before the Bhutan army operations. Thus, while the lower cadres were abandoned to their fate, the senior leadership ensured its safety by fleeing to Bangladesh. Six of the 14 members of the central executive committee of ULFA and a large number of the commanders and Deputy commanders of the ULFA’s armed wing are now permanently based in Bangladesh. The report stresses that Bangladesh has actually become the operating base of ULFA after the Bhutan operations. Dhaka has consistently rubbished charges of providing shelter to any terrorist outfits. Bangladesh’s importance for ULFA today is reinforced by the fact that Bangladeshi territory is the landing area for all arms procurement by ULFA. The truth of this was brought home dramatically in April 2004 when a huge consignment of arms and ammunition was seized when the contraband was being unloaded at Chittagong port. Interrogations have indicated that ULFA had played the major role in arranging the consignment and was to be its biggest benefactor. This is not the first time that ULFA has utilised Bangladeshi territory for bringing in weapons and smuggling them to India. Interrogations conducted after the Bhutan operations have clearly indicated that almost the entire weaponry of ULFA is routed through Bangladesh. In fact, ULFA had smuggled into India another major arms consignment through Chittagong in the year 2000-01. The report points out that today Bangladesh is the fulcrum for all ULFA activities. Arrested cadres of group like the NDFB, the ANVC and the KLO have clearly outlined that the smaller groups depend on ULFA’s network in Bangladesh for their sustenance. This network is well established and varied in nature, with contacts in political, religious and government circles, including security agencies. ULFA is the favoured group among all anti-India elements in Bangladesh. Assam has been rocked by a spate of recent attacks by ULFA. These attacks on oil infrastructure and civilian targets have come in Upper Assam. The attacks on civilian targets by the ULFA, which have led to loss of innocent civilian lives, is a new feature for the state. The worst incident in recent months is the improvised explosive device blast at Dhemaji College on August 15, 2004, which claimed 16 lives, mostly women and children. These elections are being viewed as an acid test for the Dr Manmohan Singh led UPA government and an indicator of the people’s perception of the policies of the Congress led government at the Centre. The results of the May general elections were seen as a vote for change and rejection of the policies of the BJP led NDA Government. The Assembly elections and byelections are being seen as a vote of acceptance or rejection of the UPA coalition politics at the Centre, however, the local factors would play an important role in the state. With stakes of both the BJP and the Congress high in Maharashtra, both parties have taken no chances and have paraded all their top leaders and others to catch every possible vote. However, the decision of the Bahujan Samaj Party, Samajwadi Party and the Left parties to go alone has made the contest a close one. Opinion polls carried out by different organisations have come out with divergent results and each region is throwing up different permutations and combinations of factors, which would ultimately decide the verdict. In a move to leave voting to chance in this closely contested elections, , the Election Commission has decided to deploy adequate number of forces in Maharashtra to ensure free and fair elections. The poll panel said as many as 66,000 EVMs would be used for the one-day elections throughout the state. The commission said a special revision of electoral rolls had been completed for Maharashtra with January 1,2004 being the qualifying date and there were 6.58 crore electors, an addition of 32.29 lakh. Apart from the national dynamics, the byelections also have regional political implications. The elections for the two seats in Punjab — Kapurthala and Garhshankar — are being seen as crucial for the state Chief Minister Capt Amarinder Singh to consolidate his hold Chief Minister. On the other hand the Shiromani Akali Dal is projecting that the result of these elections would be a verdict on the performance of Congress government in the state. A vote in their favour will make the Akalis step up their stir against the Congress, government in the state. Victory of the Congress on the other hand, would consolidate the hold of the Chief Minister and would quell the voices of dissent in the party at least for the time being. In addition to the political implications, the elections would witness the introduction of braille signage voting machines. These are being introduced in the Asif Nagar Assembly seat in Andhra Pradesh. The byelection to this seat is taking place following the resignation of D Nagendra. The EC has decided to have stickers pasted to the right of the blue button denoting the serial numbers of the candidates in braille. Dummy ballot sheets have also been prepared and kept in the polling booths, containing the serial numbers of the contesting candidates, their names and the party affiliation against the name of the candidate. The dummy ballot sheets in braille will be prepared in English, Telugu and Urdu which would enable the visually impaired to exercise their franchise in a free and fair manner. The Congress today lashed out against senior Opposition leaders like George Fernandes and former Prime Minister Chandra Shekhar for their attempts to destabilise the UPA government, dubbing these acts of frustration and desperation. “These tipplers and topplers” who had conspired against Rajiv Gandhi were now after the UPA government, he charged, adding they had forgotten the lessons of history as to what happened to the “gang of four” in China. “They are up to their usual mischief of spreading disinformation,” he stated. This front was floated by Mr Fernandes yesterday at a special meeting, which was also attended by Ms Jaya Jaitley, Mr Subramaniam Swamy and former minister Digvijay Singh. Mr Chandra Shekhar’s presence at the meeting has created a stir, especially since he had been involved in the formation of the UPA government. The move is also stated to enjoy the blessings of UP Chief Minister Mulayam Singh Yadav, whose antipathy to the Congress is well known. It is also being supported by Shiv Sena’s Sanjay Nirupam and former Madhya Pradesh Chief Minister Uma Bharti. Mr Fernandes’ initiative, which comes curiously soon after the UPA government handed over the Tehelka case to the CBI, is being viewed as an attempt by Mr Fernandes and his colleagues to wean themselves away from the NDA and pave the way for the revival of the Third Front. It is only by distancing themselves from the BJP that Mr Fernandes and others hope to win back their old Third Front friends like the DMK, TDP and the Left parties. Obviously mindful of the former Defence Minister’s gameplan, the Congress was quick to launch a frontal attack against them, essentially to “expose” them publicly so that their efforts are not allowed to gather momentum. Hitting out at these leaders, Mr Singhvi went as far as to point out that an “idle mind” was a devil’s workshop, stating that “several elements in the Opposition have exhibited their irresponsibility, frustration and vendetta by indulging in one-upmanship of destabilising the UPA government”. Although Mr Singhvi did not identify the Opposition leaders initially, he did not hesitate to name them when pressed by mediapersons. As many as 225 companies of Central para-military forces have been deployed in Maharashtra where Assembly elections will be held tomorrow. The Central Reserve Police Force (CRPF), which has been nominated as “chief coordinator” to monitor the movement of Central and state police forces, will contribute the largest chunk of 72 companies, official sources said here today. Besides, 153 companies of other Central para-military forces and state armed police forces have been deployed. Among these forces, the Railway Protection Force has deployed four companies, the Andhra Pradesh Armed Police five companies, the Kerala Armed Police 15 companies, Tamil Nadu 10 companies, the Gujarat Armed Police and the Madhya Pradesh Armed Police five companies each, the Gujarat Border Home Guard 12 companies, the Rajasthan Border Home Guard and the Punjab Border Home Guard 25 companies each. At least 10 companies of the BSF will be kept in reserve for the state, the sources said. Realising that the post-poll scenario in Maharashtra could depend on the large number of “Independent” or “rebel” candidates, former Madhya Pradesh Chief Minister Digvijay Singh has been entrusted with the task of “opening channels of communication” with them. Mr Digvijay Singh was rushed to Maharashtra initially to placate the rebels in the fray and to dissuade them from contesting against the party’s official candidates. He has now been asked to ensure that they don’t stray to the opposition camp. It has now become increasingly clear that the rebels from the Congress-NCP combine, who far outnumber those from the opposition camp, could well hold the key to government formation in Maharashtra in case of a hung Assembly. It is estimated that there are at least 100 rebels in the fray. AICC sources said Mr Digvijay Singh, who has been camping in Maharashtra for nearly two weeks now, has been on the job for sometime now. 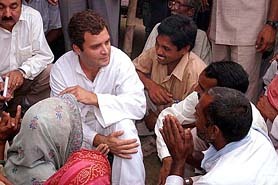 He is in constant touch with the “Congress rebels”, particularly those who are seen to be in a winning position. Whatever the party’s official position, the Congress would be willing to do business with these “Independent” candidates if it is required for the formation of the next government. However, the party is treading with caution. While maintaining that the present state unit president, Mr Bhajan Lal, could be replaced, party leaders are equally keen to see that in this process the Haryana strongman does not get alienated. Mr Bhajan Lal, who sees himself as a chief ministerial candidate, it was stated, would have to be given an equally responsible role in view of his following in the state as well as his potential for creating problems for the party. “Whatever we do, we cannot ignore Bhajan Lal,” remarked another AICC leader. Although the final decision on these changes will be taken by Congress President Sonia Gandhi, several proposals and names are under discussion in the party. There is one view that both the PCC president and the CLP leader be replaced in order to give the state unit a “new look.” Former Youth Congress president Randeep Surjewala’s name is doing the rounds for the PCC president’s post while Haryana MLA is to be talked about for the CLP leader’s position. Several reasons are being cited for these changes. This combination, it was pointed out, would appease both the Jats and the non-Jats. It will also ensure a “level-playing field” for all the chief ministerial contenders — Bhajan Lal, Birendra Singh and Bhupinder Singh Hooda. Although there are murmurs about Mr Randeep Surjewala’s poor record as Youth Congress president, there is also a view in the party that the electorate is looking for “fresh blood and new faces” as seen in the recent Lok Sabha elections. From the party’s viewpoint, it would be an advantage to have a PCC chief who is not in the race for the Chief Minister’s post. Serious differences have cropped up between the Sangh and the BJP over the approach to the newly floated Rashtriya Swabhiman Manch (RSM) with the former whole-heartedly backing it and the latter distancing from it. 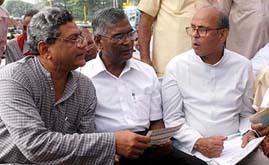 The RSM, which was launched yesterday by a group of “out of power” and “frustrated” politicians at the residence of former Defence Minister George Fernandes, were trying to generate political momentum by exposing various deeds and misdeeds of Congress president and UPA Chairperson Sonia Gandhi, an issue very dear to the Rashtriya Swyamsevak Sangh. The RSS had asked the BJP to take up Ms Gandhi’s foreign issue vociferously in the past. The results of the 14th Lok Sabha elections and the recently conducted election campaign in the Maharashtra Assembly elections had apparently convinced the top BJP leadership that such issues would cause more damage to the party than help in expanding its mass base or its appeal, sources said. The failure of “Tiranga Yatra” by former Madhya Pradesh Chief Minister Uma Bharti and Savarkar issue did not generate the expected emotions, this offered enough proof that the era of “non-issues” paying rich political dividends were over, a leader said. A top leader in the party was of the view that the demolition of Babri masjid in 1992, and the raking up of Ms Gandhi’s foreign issue during the past five years had damaged the party’s prestige in the popular perception, the sources said. Theatrical interventions by leaders like former Health Minister Sushma Swaraj and Ms Bharti on the issue of Ms Gandhi becoming the Prime Minister after the results of 14th Lok Sabha, possibly provided an opportunity to the Congress President to don the mantle of a martyr, a leader said adding that it gave the party a “bad name”, while it was true that Ms Bharti had extended her support to the RSM but she had not consulted the party. She had been under the excessive influence of the Sangh parivar, the leader pointed out. Ms Bharti may soon be given a responsibility in the party and then she may become occupied, the leader said. The party was of the view that leaders, who had associated themselves with the RSM, were discredited in the popular perception and had nothing constructive to undertake at the moment and therefore it was not prudent to join it, the sources pointed out. However, the party would not oppose the RSM publicly, leaving the issue of support for the future, the sources averred. The Centre also asked all departments and agencies concerned, like the Directorate-General of Foreign Trade (DGFT), Customs, Ministry of Steel, Ministry of Shipping, etc, to review policies and procedures to rule out the possibility of live shells finding their way into containers bringing scrap material into the country. Customs authorities were advised to tighten and streamline the inspection procedures for scrap at ICD, Tughlakabad, Delhi, and other Customs warehouses. These directions followed a review meeting this evening, chaired by Union Home Minister Shivraj Patil and attended by senior officials of the Ministry of Home Affairs to discuss the situation arising out of the recovery of explosives in the scrap imported by iron and steel companies in Uttar Pradesh. Mr Patil asked the states to step up vigilance and undertake the inspection of steel factories to ensure that live shells were not lying there. In the light of recovery of such objects in public areas like roads and river beds, Mr Patil also directed the states to ensure that rockets, mortars and shells were not dumped by factory owners in public places and any such item in scrap be brought to the notice of the local police, Special Secretary (Internal Security) in the Ministry of Home Affairs Anil Choudhary said. In the morning, an inter-ministerial meeting, chaired by the Special Secretary (Internal Security), discussed the situation and called for appropriate measures to ensure that such materials were prevented from making their way into India, sources said. During the meeting, the Centre asked Customs authorities to tighten and streamline inspection procedures for scrap at the ICD, Tughlakabad, and other Customs warehouses. Delhi is yet to recover from the aftershock of the Supreme Court ordering the closure of industries operating illegally in residential areas, but come October 15, many more industries risk closure for discharging hazardous waste in the Yamuna and for not contributing their share in installing common effluent treatment plants (CETP). This is the third in a series of Supreme Court orders that have virtually sounded the death knell for industries in the National Capital. First the apex court ordered the relocation of industries to designated industrial areas on the outskirts of Delhi and then ordered the closure of industries operating illegally in residential areas. October 15 is the deadline for the industrial societies in Delhi to contribute 50 per cent of the cost for setting up common effluent treatment plants and to ensure that the plants are functional by then and also adhere to the stipulated norms. The matter traces its origin to a public interest litigation petition filed in the Supreme Court. However, even as the noose tightens around the industries, the Delhi State Industrial Development Corporation (DSIDC) and industrial societies are busy trading charges. The DSIDC says the industry is reluctant to pay its share, running into several lakhs of rupees. The industry accuses the DSIDC of imposing impractical terms of business. According to Mr Jalaj Srivastava, Chairman and Managing Director of the DSIDC, tens of thousands of industries would be affected if the court takes a stern view of the matter. “It would be difficult to quantify the estimated loss-tens of thousands of industries would be affected so you can make your own conclusions,” he told The Tribune. As per the Supreme Court order, the industrial societies were to bear 50 per cent of the total cost whereas the Delhi Government and the Union Government would pay 25 per cent each. Accordingly, the industries were given time till August 31 to fulfil all necessary conditions. The deadline was later extended to October 15. The DSIDC and the Nagpur-based National Environment Engineering Research Institute were mandated to design the CETPs and to assist the industrial societies in setting them up. The total cost of the project was pegged at Rs 250 crore. The Supreme Court passed an order in 1996 on a civil writ petition in the M. C. Mehta versus the Union of India case. Later, the monitoring committee set up by the court made it incumbent on the industries to make the CETPs adhere to certain norms for reducing the pollution of the Yamuna. The monitoring committee subsequently constituted a supervisory group headed by a Prof Siddiqui of Aligarh to prevent the banks of the river from turning into an illegal waste dump. A “dastar” of Guru Gobind Singh and shoes and “kharavan” of Mata Sahib Kaur and Mata Sunder Kaur were displayed for public viewing at the Guru Granth Sahib Research Centre, on the premises of Gurdwara Rakab Ganj, here today. The dastar is made of tussar and is beige in colour. These priceless relics belong to family of Mai Desan in Chak Fateh Singhwala village of Bathinda district in Punjab. Mai Desan was a devotee of Guru Gobind Singh. According to popular belief, Guru Gobind Singh, during his travels in the Malwa region, stayed in the “bhora (basement)” of Mai Desan’s house and before leaving gifted her some of his belongings. In the present age, when in the name of kar seva historic buildings are being replaced by marble structures, the bhora of Mai Desan is perhaps the only historic structure of its kind where the original form with mud walls and thatched roof have still been retained with relics of the Guru, including a bed on which the Guru had slept, two cotton bed sheets, shoes belonging to Mata Sunder Kaur and Mata Sahib Kaur, a handwritten Guru Granth Sahib with 534 pages, a wooden “piri (stool)”, a “tawa” on which langar was prepared for the Guru and a “bairagan (armrest)” of Bhai Sangu Singh, an ancestor of the family. These relics were located and photographed by the National Institute of Punjab Studies and conserved by the INTAC Conservation Laboratory, Lucknow. According to Dr Mohinder Singh, director of the Bhai Vir Singh Sadan, there is also a reference to these relics and the Guru’s visit to Mai Desan’s house in the works of Bhai Vir Singh. The dastar, before conservation, was very brittle and had been kept wrapped in a polythene bag. Bhai Jasbir Singh, present custodian of these relics, has brought these out for public viewing at the centre for a month. Efforts are also being made to restore the bed used by the Guru. As far as the population policy was concerned, he said the government was committed to a target-free approach and no coercive measure should be used to enforce the two-child norm, as was being done by some states in the country. Speaking at the National Consultation on Gender and Health in the Capital, he said according to estimates, India had 5.1 million HIV/AIDS cases. “I want to know exactly how many such cases there are in the country, where we are heading and where we are not acting.” he said. Pointing out that a lot of social stigma was attached to HIV patients, he said the government was also considering bringing in a legislation to prevent the discrimination of patients suffering from HIV and AIDS in the country. Disclosing that only 30 per cent of the population had heard of the term “HIV”. He said the ministry would launch an awareness campaign about HIV and AIDS in the country. Stating that women were the silent sufferers who get affected with the disease unknowingly, he announced that the government’s programme would focus on involving the community as well as the NGOs in sensitising the women on the issue. Addressing health secretaries of different states, he said some states were using forced sterilisation to enforce the two-child norm, which was totally against the fundamental right of an individual. “ I had a meeting with the Prime Minister this morning and we are of the view that no coercive measure would be used in any scheme,” Dr Ramadoss said. She said the commission had prepared awareness material on female foeticide for schools and colleges and had asked the Ministry of Health to release it on November 26, the day Indian Constitution came into force. Mr Jaiswal will have detailed meetings with Prime Minister Manmohan Singh, senior intelligence officials, and Union Defence Minister Pranab Mukherjee on the proposed talks before reaching Guwahati for a day’s visit. A senior official in the Chief Minister’s secretariat said the All-Bodo Peace Forum (ABPF), a front of the NDFB, had already offered to act as a mediator for the talks. Chief Minister Tarun Gogoi has already told Prime Minister Manmohan Singh that at best the state government could act as a facilitator for the proposed talks between the NDFB and the Centre. The NDFB, in coordination with ULFA, after carrying out a series of blasts and shootings, offered unilateral ceasefire on October 8. NDFB president D.R. Nabla stated that his outfit would cease fire for six months from October 15 to create a congenial atmosphere for talks. Participating in a demonstration against the Delhi Government’s drive against the industries, they demanded that the Centre bring an ordinance to amend the Delhi Master Plan, which prescribes the closure of non-conforming industrial units in residential areas. Announcing this at the rally organised by the party, senior CPM leader Sitaram Yechury threatened that an all-Delhi bandh would be organised and more than 1.5 lakh people would take to the streets if the government did not come up with the ordinance within 10 days. “We will submit these demands to Prime Minister Manmohan Singh and UPA Chairperson Sonia Gandhi,” he said. The ministry ordered the investigation after it received complaints from certain quarters. This is not the first time such a probe has been ordered. The ministry has ordered similar probes into the National Council for Educational Research and Training, the ICHR and the ICSSR. A press note of the ministry said today that the executive chairman of the Institute for Social Development, Mr D. Bandopadhyaya, would conduct the investigation. Special CBI judge A.R. Joshi rejected Ajwani’s application saying the evidence before the court went against the accused. A total of 175 bodies have been recovered so far from lower Assam’s Goalpara district where the flash floods washed away 220 villages, while both road and rail communications between lower and upper Assam remained disrupted for the fourth day today. The Chief Minister, Mr Tarun Gogoi, told mediapersons here today 175 bodies had been recovered from under the flood waters with the possibility of the death toll rising further as bodies continued to be salvaged. The President A.P.J. Abdul Kalam has appointed four new judges of the Kerala High Court. Kuttiyil Mathew Joseph, Thottathil Bhaskaran Nair Radhakrishnan, Ramkumar Vadakkedath and Ms Kolangaredath Hema have been appointed judges of the Kerala High Court by the President, an official release today said. Their appointment would be effective from the day, they take charge of their office, it said. Earlier, Law Minister H.R. Bharadwaj said that their appointment was cleared by the Supreme Court Collegium sometimes back. Guinness Record holder and National Tourism Award winner locomotive Fairy Queen will once again haul the special heritage train between Delhi and Alwar during the 2004-05 tourist season. A statement issued by Northern Railways said that Fairy Queen will run nine trips of two days each. It will depart from Delhi cantonment at 10 am and reach Alwar the same day at 4 pm. On the next day it will depart from Alwar at 1 pm and arrive at Delhi at 6.45 pm. The first trip will be made on October 23. Two trips each will be made in November, December, January and February.